Jeremy Corbyn will be in Warrior Square on the day of St Leonards Festival! Who’s reigning on the Parade? This morning – the day of the St Leonards Festival – at 9.30, the streets of St Lens were stirring. The Kings Road market was nearly up and ready for action, whilst dismayed dog walkers clustered around Warrior Square staring at barriers and white vans which blocked their normal promenade paths. “It’s all gone arty farty and political,” I heard one woman say to her companion, HOT’s Erica Smith writes. 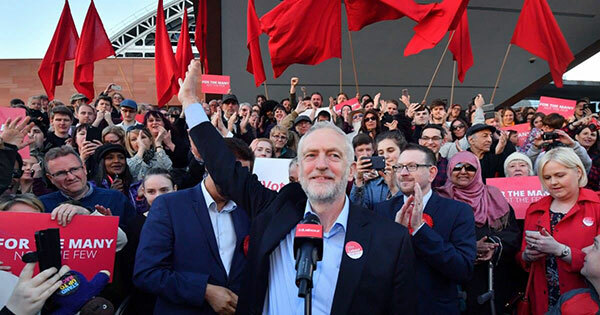 The rumours that have been flittering around Facebook for the past few days are true: Jeremy Corbyn will be in St Leonards Warrior Square this morning. You are advised to register in advance, and get there for 10.15, with Jezza on stage at 11am. It is simply a coincidence that Jeremy Corbyn has come to town on the day of the St Leonards Festival. It is the first stop on a tour of 70 marginal constituencies. It is significant that Hastings and Rye is top of his list. Those 346 votes won’t be forgotten in a hurry. Love Jezza or hate him, it has to be good news for the St Leonards Festival that he’s come to town. The extra crowds are bound to join the festivities and shop in the market. Watch this space for more news after the event! Dear Ms Doubtfire, you already know that as a rule I do not set to allow comments on articles I write. And you know why. As it goes, I checked and there were 4 comments to be ‘approved’ on this article, all of them are from you. No-one else. I’ll attempt to reply to all your comments, which takes up more of my ‘free’ time. You know that’s why I don’t allow comments as a rule. I spend enough of my ‘free time’ writing articles for HOT. The most important point is that the organisers of the St Leonards Festival chose NOT TO USE Warrior Square as the focal point of the festival this year. That decision was made well in advance of the event. Because Hastings & Rye is now such a marginal constituency, it makes perfect sense that the Labour Party would choose to launch a tour of marginals in this constituency. I am a member of the Labour Party, so I know that the visit was planned with less than a week’s notice. Warrior Square was the obvious venue to use. St Leonards is Labour Party voting heartland. It was indeed a pure coincidence that Jeremy Corbyn’s visit happened on the same day as the Festival. I think it was a fortuitous event because it was an extra reason to bring a crowd to the area. The market stalls and shops in Kings Road did very well on that day. The owner of Calneva in Kings Road said it was her best day of trading since her shop opened. “My mate Jezza”… no-one else except you has been bothered to write comments. I wasn’t that bothered that I didn’t see ‘my mate Jezza’. I was volunteering at the Ore Valley event – another great local event which clashed with St Leonards Festival. That clash was not part of a conspiracy either. I wrote the article because I hate rumours, especially unfounded ones. I knew some people would want to know what was happening in Warrior Square, and the article makes it clear that Jeremy Corbyn’s appearance was nothing to do with the Festival. That is fact. Not propaganda. I hope my reply satisfies you. Not posting anything which criticizes your mate Jezza eh Erica? Interesting one this – all comments which are not favourable to Corbyn are apparently refused publication. Can Erica Smith please explain why she considered it to be good news for the St. Leonards Festival that Corbyn came to town? From what we could see his visit seriously curtailed the activities on the Warrior Square gardens. The usual vibrancy and activities were confined to a small area on the beach and far away up the road near the shops. Clearly arty farty and political were apt descriptions. Only the arty farty element was not much in evidence this year and this is the element which is most pleasing at this festival. Extra crowds? Well, yes but only for an hour or so and where was all the usual activity on the Warrior Square gardens? Nothing to be seen there this year. After Corbyn legged it back to London the area was deserted. All action seemed confined to a small area on the beach below the steps…Did Corbyn’s visit put the mockers on the St. Leonards delights which we would normally see in the Warrior Square on this festive occaison? If so, may I suggest that next year, all politicians are refused admission to spout their policies on any of our festive occasions. This is not the time or the place for this political mayhem.